About two months, John and I ventured across the ocean by ourselves; it's the first time since we met 12 year ago on a study abroad trip to Egypt that we've gone abroad alone. A year ago at this time, I'd expected that our next trip would be centered on the two of us because a year ago at this time, we had finally completed the adoption of our two daughters and been home together as a family of six for an entire year; feeling quite settled and done with adding children to our family, I was anticipating that our next trip alone would be our always-pushed-to-the-future honeymoon. But the honeymoon remains in the always-pushed-to-the-future status. At the beginning of May, we ventured off alone together to live in the Baltics for three weeks, with the intention of bringing back home to the States with us the newest member of the family, our 16-year-old daughter. Our newest addition is the oldest biological sister of our two other daughters, both of whom were adopted two years ago. She's our surprise baby, to put a complex situation simply; she's a gift we hadn't anticipated or planned. There was a beautifully serene slowness to the trip once we arrived for our three-week stay; we planned the entire trip within three days and we left within five our receiving our referral. While we were in country on the adoption trip, the three of us lived together. During that time, I sipped actual hot cups of tea, soaked in God's Word, experienced life abroad in a way I haven't since before we had our biological sons and remembered what it's like to just have one baby on which to focus much of my attention, energy and love. It was restorative in so many ways, and it was life-giving in so many ways, too. Our time spent with our newest daughter was a gift, truly, and it was such a lovely foundation to build upon as we re-entered life as we know it at home with four, now five children. One evening, while our oldest daughter spent time with her friends, John and I spent time walking down new-to-us streets, exploring the city we've called home for a month at a time the past three summers now. As we walked, I didn't realize there were so many parts of the city we had yet to discover. It was mind-blowing for me -- this realization that there was still so much to understand, explore and know about this city we've called home for about one month every year during the past two, now three, years. During that walk, we happened upon my new favorite street on a quest to get to city center after dinner; we took a path that we didn't yet know, one that was very different than the main road we have normally taken. 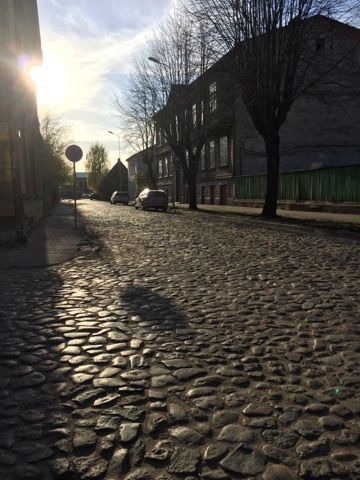 We didn't exactly know where we were going when we decided to follow the uneven cobblestone street toward where the sun was setting, but we knew the direction we were heading would take us where we wanted to go. Can I just pause here and say that I never anticipated this? This life of following hard after Love; my life feels so surreal sometimes that I don't even know how to explain it. Since I surrendered my life to following Jesus 12 and a half years ago, Jesus has become so much more to me than a far-off historical figure. After many years of simply accepting Jesus' existence and believing, now following hard after Him and getting to know Him and His ways step by step certainly reframed my entire understanding of existence as I know it and has blown apart what I thought Christianity looked like. This adventure of following after His heart of love has brought me down the most unexpected, challenging, beautiful roads ... ones I didn't even know existed. Ones I'm really glad I didn't miss.